I had an assignment years ago to photograph a rafting trip on the Copper River from WR-SE to Cordova, Alaska, and it was one of the wildest places I have been. One morning, we awoke to find our riverbank campsite flooding from rapidly rising water. We had about an hour to break camp before it was totally underwater and one of my last photos was my fellow guest standing on a patch of sand that was probably 6’x6′. We all got aboard and launched. 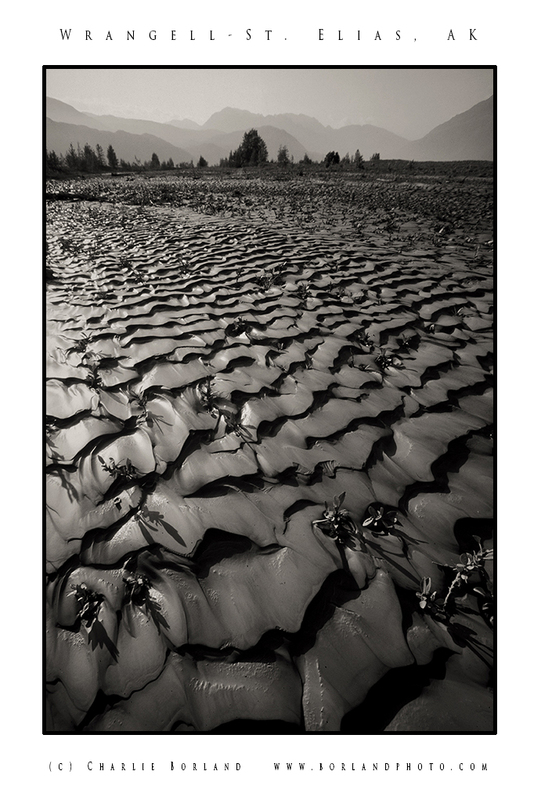 A couple days later the waters had subsided and left these amazing patterns in the soft mud. The guides said the cause was most likely an ice dam in the river, way up in the Chugach Mountains, has busted unleashing the water. I was treated in the aftermath, to these amazing patterns along the riverbank. I used my Canon EOS 1N and Canon 16-35mm lens for the shot with the lens set to 16mm. That made the foreground closer to the camera which emphasizes the foreground. I next processed the photo in Photoshops B&W adjustment layer. Here’s a photo from Pt. 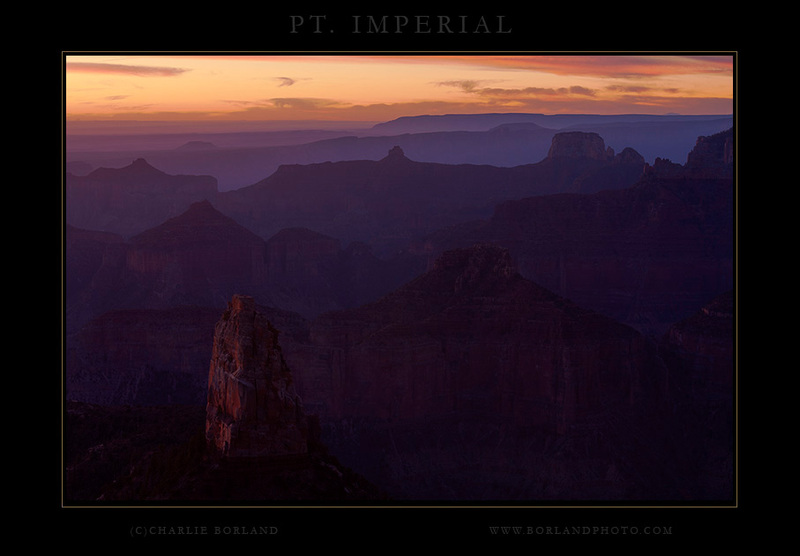 Imperial where I made the journey from outside the park to the rim before sunrise. It was a perfect morning with pretty clear skies. I took the photograph before sunrise at 6:40 am which was 13 minutes before sunrise. When shooting pre-sunrise, if you start early when the alpenglow type light is evident, you have less contrast compared to the minutes before the sunrise. When photographing wide-angle landscapes, often the goal is to make sure everything is in sharp focus. The reason is that usually, we do not like to look at out of focus areas of our scenes. While that shallow depth of field can be a powerful technique to get viewers to look at something in your composition that deserves all the attention, wide-angle landscapes can be more powerful when everything is sharp. Looking at this scene, from Oregon’s Willamette National Forest, you see a scene using a great depth of field. But stop for a second and think about what your end goal would be for this scene. Is there anything you would want in focus and the rest out of focus? The foreground maple leaves are probably what I would call the ‘star of the photo’ so they should remain in focus. In this case, the background could be thrown out of focus and that would support the approach of forcing viewers to look at the foreground maple leaves. Making the background sharp and throwing the foreground maple out of focus would only create visual chaos because the foreground maple is so large in the frame. That big out of focus maple creates a visual roadblock that stymies viewers who want to look through the scene to the background. The answer is to use the Near/Far technique of making sure everything is in focus. This supports the foreground elements and the background as the two areas of the scene are more visually in-sync. I had a really fun photo assignment last month, photographing at the Royal Peacock Opal Mine in Nevada. This mine is a U-Dig operation where anybody can visit, buy a pass to dig in the mine, and hopefully uncover some amazing Opals. 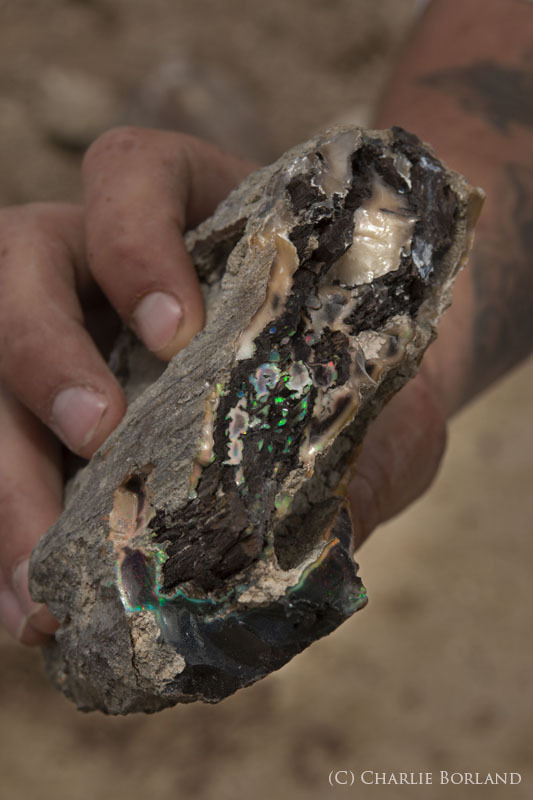 What was explained to me, and I may not recall exactly, but this silica solution enters into the wood that is buried and estimated to be 12 – 15 million years old, and that wood eventually becomes petrified. 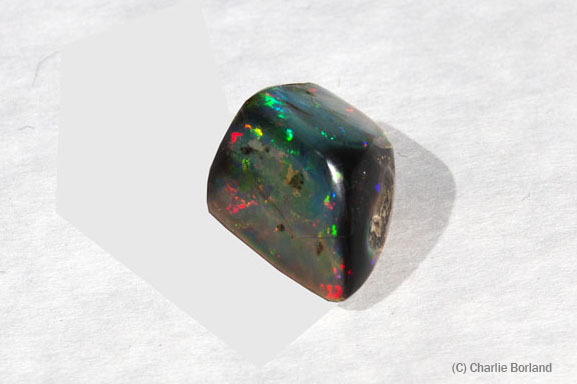 Once the moisture leaves the solution, it becomes an Opal. 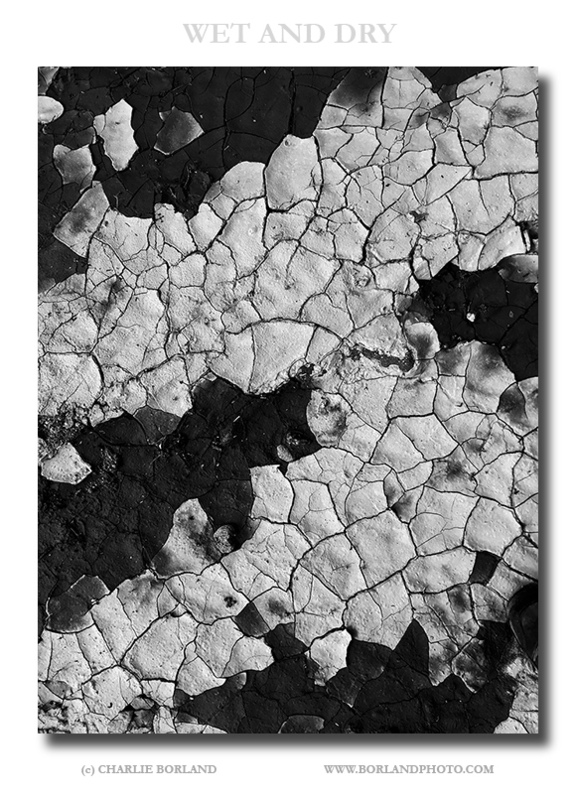 As I was hiking the desert this last winter, I spotted an area where rain had collected and created this pattern. What I thought was very interesting was how the mud was totally wet and then following the cracks, totally dry. It made for a nice composition was my feeling and I shot it with an iPhone. But you can see by this pre-processed image below, the photo would not work without some good processing since it was totally flat looking. Want to Make Money in Stock Photography? Photograph Global Warming! Death Valley is the Most Amazing Place! 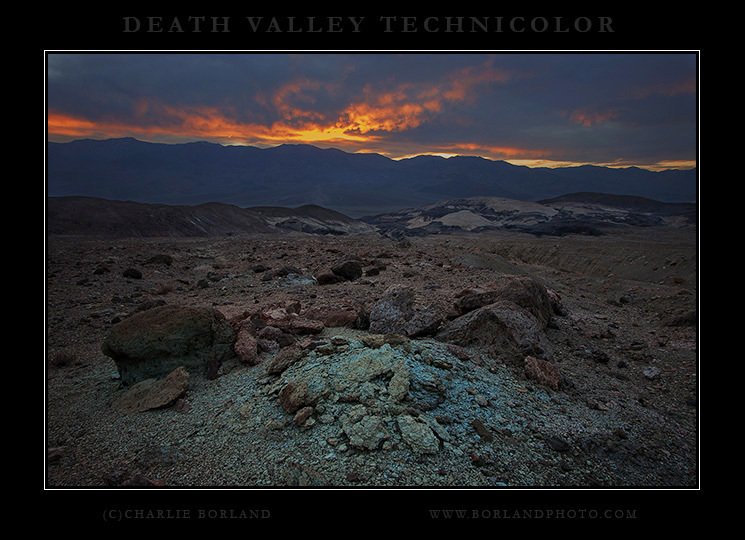 I think Death Valley is SO amazing! I have photographed in every state in the lower 48 and while our country has the most amazing diversity of landscapes, for me Death Valley is the most unique! I have been there more times than I can count and there is always something new. On my last trip, I was driving a road when I spotted the pitch black, almost coal colored geology in the far distance. So I hiked down there and photographed some variety of scenes, all under an overcast sky. When the sun was setting (before the color show) I started back when I stumbled on this scene of turquoise colored sediment. I have no idea what it was (I am not a geologist) but I knew it would make for a great foreground. The Arizona Wildflowers are here. 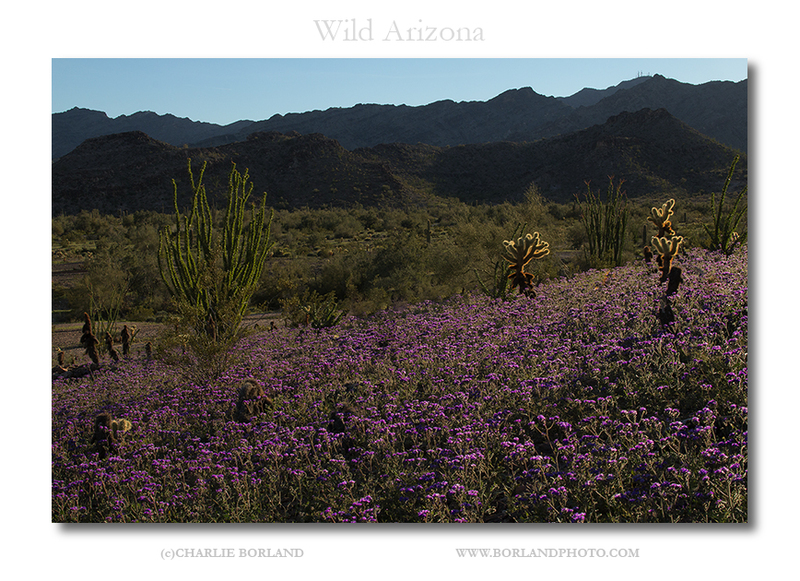 The flowers are out and while I have only hit this location in western AZ, near the CA border, I am hoping to head to the Superstition Mountain and search for their wildflowers soon. I zoomed in on this landscape a little. rather than go real wide and the reason is that the foreground flowers are not that close together. But standing further back and zooming slightly, I was able to stack teh flowers and make them look more condensed. For processing, I am now a big fan of Sean Bagshaw’s Luminosity Mask system where I can select individual sections of an image based on tonal values, or colors, and process each of those individually and it works great. Check out my ebooks and online courses on the right sidebar. 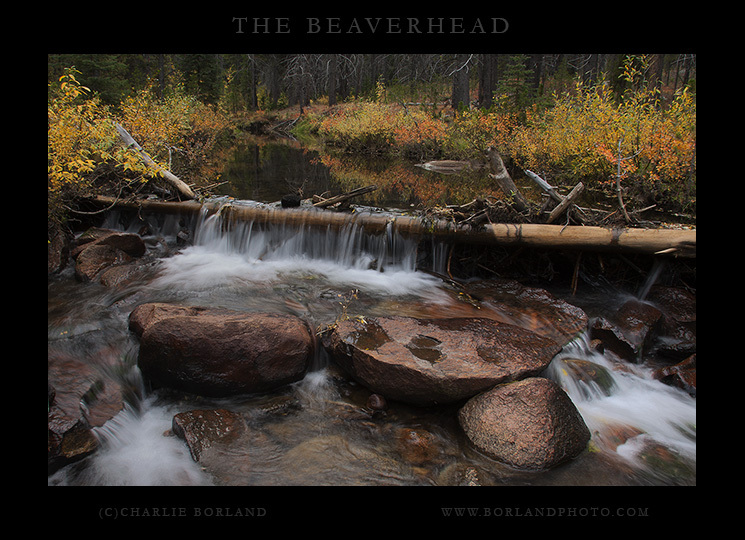 Watch my Nature and Landscape Photography webinar. On a trip through Montana, I went into the Beaverhead NF to explore the ghost town of Coolidge. 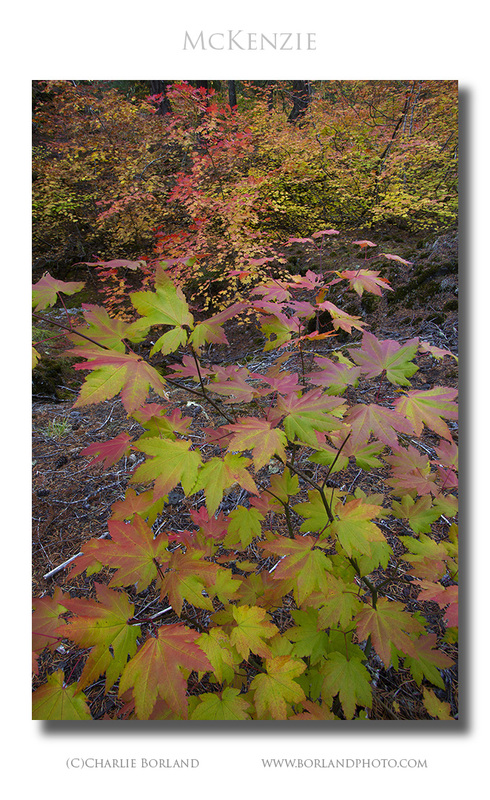 While the ghost town was not that photogenic, Elkhorn Creek was lined with some great color. This fallen log was jammed with debri creating a cascade in the creek. Throw in the rocks and you have a nice balance of blurred water, the still creek leading you to through the picture, and the lines of the colorful willow. Elkhorn Creek in Beaverhead NF Montana. For processing, I used luminosity masks to add detail to the flowing water by darkening it slightly. Then selecting the colorful willows and bumping contrast and saturation, selectively. Finally, I selected the green forest in the background and darkened them to allow the colorful willow stand out more. Checkout my eBook, online courses, on the right sidebar. 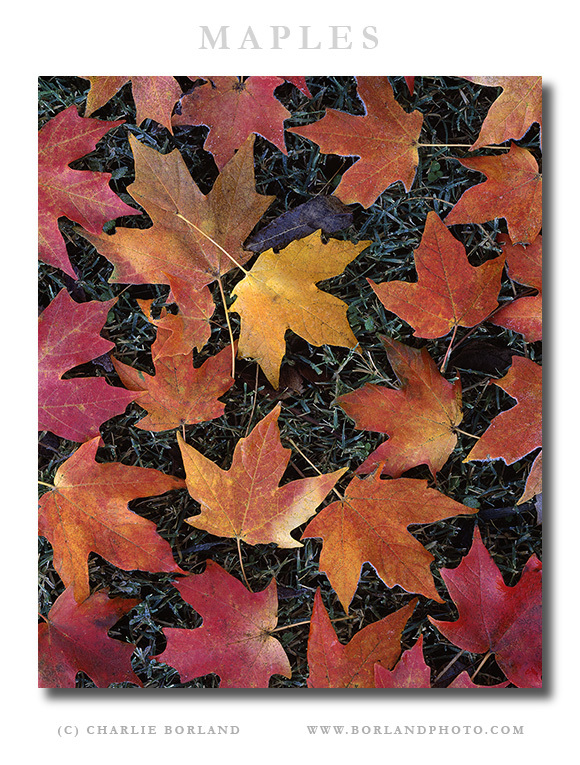 This is a fall color mosaic of maple leaves that I setup. They were on a lawn and spread unevenly, so I arranged them to fit the frame to my liking. While some might feel this is not nature photography because it is arranged, it sold as a stock photo a couple times including a cover. So who cares, right? I truly believe if you are in the business of pro photography, that you Make photographs, not just Take photographs.